The following information is provided by the Novato Chamber of Commerce. 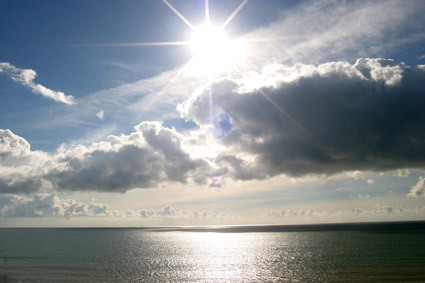 Since Marin weather is mild in general, so most of home owners do not need nor do they have air conditioner. This information can be very helpful for the rare, but very uncomfortable scorching hot days in Marin. This is very important for the very young, the Seniors or others with health conditions who need to be especially careful when weather conditions change drastically! The following facilities have graciously agreed to open their doors as Cooling Centers (to those of any age) in Marin County in times of need. Hours of operation as a Cooling Center are informally offered and may change when necessary. Each site is air-conditioned, has water for drinking, a restroom and seating. 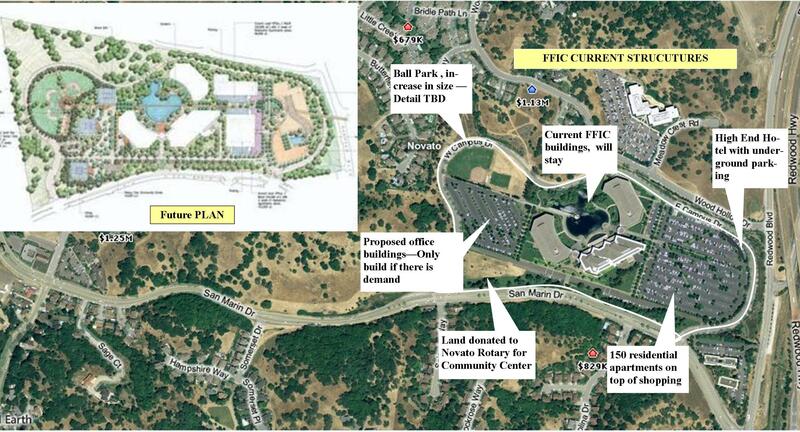 I recently (June 17th) attended a neighborhood presentation by American Assests, developer of the FFIC Site, about the proposed plan for their new project for the site – “Commons at Mount Burdell”. I attended the meeting as a member of San Marin Improvement Association (SMIA) as well as a concerned Realtor who lives close to the project site and an ex-FFIC employee. I have a vast interest in the project, for me, for my neighbors, for my friends and for our local community. I was probably the only one from SMIA, while most others were residents across from FFIC. Since this will have a major impact on our neighborhood, I have decided to share with you the information I gathered at the meeting. The following are notes at the meeting. In the interest of accuracy, I asked Ms. Margi Goodman, representative of American Assets, to review the notes and have made corrections accordingly. To start with, from the information I received, I have created a graph with current FFIC topography and American Assets’ “Commons at Mount Burdell” plan for comparison. John Chamberlain, CEO of American Assets, the owner of the site, was the presenter at the meeting. 1. The project is called ‘Commons at Mount Burdell’, a place developed to serve the local community. All the development is confined in the ‘LOOP’ – meaning the driveway surrounding FFIC campus with two entrances – West Campus and East Campus drive. 3. The additional buildings will be built on the current parking facilities. All future parking will be underground with the exception of parking right in front of the center FFIC building, which they will keep as well as parkings for the two residential buildings. Parkings for the two housing structures will be in the middle of the buildings and not visible from outside. The hotel will be located at the far east side of the property. The plan currently calls for a craftman style facility with 175 rooms, meeting facility, a large banquet room – capacity of 450, restaurant and the health club. 5. A residential facility in between the Hotel and FFIC building. The facility will house 150 units. The current plan is around 1/3 1BD/1BA units and 2/3 2BDs/1BA units. Rentals for 6 months to 12 months leases. All rental units will be on 2nd floor and up. 20% will be low income housing. The first floor of the rental building will be shops and restaurants. Although after further inquiries (comments were there is really no need for restaurants and shops there), John said that the eateries will mostly consist of coffee shop, small stores, etc. for the hotel, apartment residents and office workers. 6. A few small office buildings will be built between the West Campus Drive and FFIC building. These will be built in the future pending needs. 7. They will donate a small parcel to Novato Rotary to build a community center. 8. The current ball park will increase in size. Some feedback is for multi purpose field. My personal feeling is that, the field and the community center for Novato Rotary, are part of what the developer wants to do to give back to the community and build local goodwill. The exact plan is not clear at this point. American Assets has contacted little leagues, etc, and will possibly be looking at a mixed use facility which they will build and maintain for local usage. 9. The total projected usage will be for 5,000 people – the original maximum occupancy designed for the FFIC site. At the height of FFIC, there were 2,000 occupants and they currently have around 1,000 people on campus. 11. Current FFIC buildings are up to 80ft tall. The new buildings will be 40 feet at most (most parkings will be underground). 12. Per developer, they hope by doing this, they will be able to lower FFIC operating costs which will encourage FFIC to stay in Novato (there is always that speculation) and keep local employment rate up. With the new facility, they hope to attract other occupants, prevent the buildings from sitting empty and increase sales revenue for the city. 1. Traffic in and out of the site and how dangerous (per residents across from FFIC) it is currently and what it might do in the future. There are also concerns about the 101 interchange. Per developer, they are doing a traffic study including both and the plan will not go forward if 101 interchange needs to be improved – cost prohibitive. In addition, the plan might change from Traffic Study Findings. 2. The effects on home values – opinions are divided on this. Some worried about what they will see out of their windows, some worried whether the residential units will affect the value of homes. Some thought the addition of world class facilities will add to home values. 6. Secuirty (Added 06/28) – Another concern is the security of the site, especially the parking structures. The residential ones will be secured parking and public ones will have patrol – American Assets will be researching this. American Assets submitted the plan to the city on June 10th. The city shall respond in 30 days after submission. They will be conducting more neighborhood meetings to get feedback and anticipate revising plans from feedback received. They will be going through Novato Design Reviews. The high level time frame is estimated to be two years. Please make sure you attend future meetings for updated plans and let them know about your concerns. I welcome your comments and do let me know if I have missed or misrepresented anything. I will gladly make corrections. Ms. Margie Goodman has kindly agreed to keep me informed of updates and future meeting schedule so I can post them on this blog. Please come back and check periodically. The President of American Assets (John Chamberlin) will be there to show you the proposed project, listen to your feedback and answer any questions. Please email me at sylvia@SylviaSellsMarin.com if you would like to be notified of future meetings. 1. City of Novato Planning Department – Redevelopment of the Fireman’s Fund Office Campus – including two PDF files for detailed information. 2. Marin IJ Article This article basically talked about the Green building aspects of the project and did not touch upon the concerns of the neighbors who attended the meeting – mainly the additional traffic in and out of the campus with the new Hotel, residential units and office buildings. Note that the first picture showed the angle from Ball Park to the campus, but the truth is the green space on the proposed campus is much smaller. 4. Another Marin IJ Article – announcing the Sale. As can see from the list below, the entry level Novato homes are enjoying a high percentage of pending sale than two weeks. With the starting home price drops in Novato, and the avaiability of Short Sales and Bank Owned (REO) properties on the market, the first time homeowners and investors are out looking and actually buying. Several nicely priced mid range and higher end homes ($800K and up) are quickly claimed by ready buyers at the beginning of the summer housing season; a great time to shop and move. One reason of seeing increasing inventory, higher DOM (Days on Market) and higher pending rate is houses take longer to get out of pending status due to the much longer time required for lender to approve or disapprove the purchase. With proper guidance and patience, a savvy homebuyer will be able to get a fabulous buy. Make sure you do your research and your financing arrangement is ready when a great deal shows up. With proper guidance from your Realtor and patience, a savvy homebuyer will be able to get a fabulous buy now! Marin County July 4th Events – For the Patriotic You! Independence Day is a heartbeat away and one of the beauties of life in the North Bay is the variety of fun events that our charming communities organize at this time of year. Read on to learn of the many unique ways to observe this all-American holiday. Happy Fourth and be watchful of the neighborhood fireworks during this very dry season! 43rd Annual Corte Madera/Larkspur Chambers of Commerce 4th of July Parade – Elaborate floats, precision drill teams, classic cars and the Corte Madera Town Band. Route: From Redwood High in Larkspur, it moves down Magnolia into Corte Madera and continues down Tamalpais Ave to the Town Center. Post-parade: Check out the festivities at Corte Madera’s Town Park: arts and crafts, food and drink, carnival games, children’s activities and live entertainment. 16th Annual 4th of July Parade – Come see over 100 parade entries ranging from classic cars and vehicles from a military museum to Irish bagpipers and a Chinese drum and bell corps. Along the parade route, you will also find food and refreshment booths, and souvenir t-shirts. Organizer: The event is presented by the Presbyterian Church of Novato. Fee: There is a suggested donation of $5 for adults, $3 for kids. Proceeds will be donated to the Marin Community mission project. Tamalpa, a Marin running club, presents a “4 on the 4th” four-mile road race and a “Mayor’s Mile” one-mile family walk/jog. To register, go to the Tamalpa website. SesquiFest – This year, Petaluma is observing its 150th anniversary, and they’re making a joint celebration to go along with Independence Day. The day starts off with a 10K run at Putnam Park, then the celebration moves over to the Marin-Sonoma Fairgrounds for live music, fun for kids, food and fireworks display. Annual Ross Commons Picnic – Pack your own lunch, or you can order from Eddie’s. The picnic begins at noon and will take place at the Grove area of the Common. The Marin County Fair (at Marin County Fairgrounds, Civic Center Drive) offers Marin County’s official fireworks display. The July 4th concert features the Preservation Hall Jazz Band from New Orleans. The celebration begins with a bike ride with elected officials and candidates. The festival will feature live music and vendors, a bike decorating contest and parade for kids, a slow bike race, a flat tire changing contest, water balloon toss, a jump house, various art activities, drawings for prizes and more. SCBC will provide free valet bike parking. 4th of July Parade and Fireworks – This year’s parade will include the Cal Alumni Marching Band, floats of all shapes and sizes, and the Sausalito Fire Department. Route: Starting at South Bridgeway, it will move through downtown Sausalito to Caledonia St and into Dunphy Park. 4th of July Parade & Old Fashioned Celebration – Complete with booths, food, art show, games, music by the Hometown Band, Crossfire and Carlos Herrera. After dark there are fireworks at the field by General Vallejo’s house (east of the plaza). Fireworks Cruise – One of the best ways to see the San Francisco fireworks display is from the Bay! The Angel Island-Tiburon Ferry Co. will offer a 4th of July fireworks cruise. Breakfast Time & Place: 8-11 am at the Woodacre Fire Station, 33 Castle Rock Rd. Route: Starting at the Woodacre Improvement Club (1 Garden Way), it follows Railroad Ave to the Dickson Ranch. Post-Parade: A good old-fashioned celebration at Dickson Ranch – A family affair with games, face painting for the kids, competitions (including the men’s ugly leg contest), horse rides, plenty of music, barbecue, bingo, and everyone’s favorite, the flea market. As Marin property prices fall, the homeowners in Marin County are requesting their home to be reassessed, hoping to lower their property tax. Assitant Assessor-Recorder Rich Benson said most homeowners seeking reassessments should receive assessor’s office response by July 1, 2008. The office is getting requests from across Marin that involve all values from condos to luxury homes. The county assessors’ office expects to received 1,000 requests, which is about 1 percent of all homes and condos. State law requires county assessors to roll back assessments if tax values of real estate – those printed on property tax bills – are lower than the current market value. As real estate prices have been sliding, assessors in some counties have ordered reassessments without waiting for homeowners to file requests. Joan Thayer, Marin County assessor said that the likely candidates for re-assessment are homes purchased after January 2006, when most local prices peaked. Richard Benson, Marin County’s assistant assessor, estimated that more than 1,000 homeowners will have requested reductions in their assessed valuations – and thus their property taxes – by the end of June, the deadline for making such requests. HOW TO DO IT: For questions, call county Assessor-Recorder Joan Thayer, an elected official, at 499-7215, or go to Room 208 of the county Civic Center in Sa-n Rafael on weekdays between 9 a.m. and 4 p.m.
Information and a form are posted at www.co.marin.ca.us/depts/AR/main/real_property.cfm under “Valuation Review.